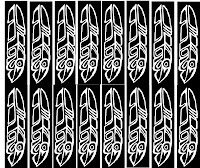 In a previous article, Acid Etching on Metals for Jewelry Making, PART I, we discussed how to transfer photocopied graphic designs to flat pieces of brass and copper for etching multiple designs. HAND DRAWING DESIGNS ON BRASS & COPPER FOR ACID ETCHING - My unscientific, but personally tested results. Another way of preparing brass or copper for etching is to draw directly on the metal using a special ink as a “resist.” You need a special ink that will “resist” the acid without deteriorating during the etching process. If you Google Acid Etching on Metal, you will find a wide variety of articles, many very helpful. That’s how I got started. I experimented with many methods before I found one that worked consistently for me. Some methods require expensive materials, like PNP (Press N Peel) transfer paper, which I found to be hit or miss compared to the heat transfer method, as explained in PART I. Other methods recommended special pens for drawing designs on copper circuit boards. Still others recommended very expensive printing press engraver inks that dry up too quickly and are messy to use. In my research, the pen that works best consistently (for me) is made in Germany. I have tried many other brands, but the ink breaks down during the etching process and ruins the final design. I can CONFIDENTLY recommend felt tip pens “Staedtler Lumocolor CD-R Pen” – They come in a package of 4 colors, Red, Black, Blue and Green. You can buy a 4-pack on Amazon for $6.99. The red pen works best as a strong “resist” to Ferric Chloride and Ferric Nitrate. But in a pinch, the black pen works for short etching sessions of 1 hour or less. If you want a very deep etch, and need to leave it in the etching bath for more than 1 hour, I would not use any color other than red. The other colors may break down in Ferric Chloride and Ferric Nitrate after 1 hour or so. Upon examining one of these pens carefully, I noticed that it says, “refillable,” which I find very interesting. I couldn’t find a way to open it for refilling. But if anyone knows how to refill one, please share your knowledge! You can use a red Staedtler pen to touch up any missed spots for heat transferred designs using photocopies with dry toner. If there is a bubble or small spot missing that didn’t transfer to the metal, simply use a red Staedtler pen to fill it in. A limitation of Staedtler CD-R Lumocolor pens is that they are only available in medium point. I would LOVE a fine point for delicate designs! I have tried at least 20 different brands of CD, waterproof, permanent felt tip pens, in a fine point, but none held up in the etching process. I even tried tapering the end of the red Staedtler medium tip pen with an Xactoknife and a pair of sharp scissors, but the tip fibers frayed unsatisfactorily. Again, if you have had good luck with a specific brand of fine point felt pen that has a stable ink “resist” for Ferric Chloride etchant, please share the good news with all of us! One nice thing about drawing your design by hand is that you can etch round objects, like bracelets. I etch designs on recycled, pure brass bullet shells and have found it very relaxing to draw designs on 100 shells or so, while watching TV at night. Before you start drawing, make sure the brass or copper is roughened up slightly with #0000 steel wool, or scrubbed with powdered cleanser like, Bar Keepers Friend. That helps the ink adhere to the metal. But to be truthful, I have been lazy, and used a red Staedtler pen on tarnished brass and it worked just fine. After the ink has dried, test your ink resist to see if it smears or flakes off. Gently rub it with your fingers. If the design stays put, it will hold up well in the acid bath. A faster method of cleaning older scrap, or dirty brass and copper, is to dip it in a “pickle bath” solution of PH Down (Sodium Bisulfate). You can buy PH Down at any pool supply or hardware store. Use 1 cup of PH Down crystals to 1 pint of tap water. (Water warmed up in the microwave works even better.) This “pickle” bath will clean up the metal nicely. Then, rinse copper, or brass, in water and dry thoroughly before drawing your design on the metal. Once you have drawn your design using a red Staedtler pen on the metal, you can store it for months without etching it. Keep it clean, in a bag or box, and the ink will hold up well until you are ready to etch it. NOTE: If you make a mistake and need to start over with your hand-drawn design using red Staedtler pen, you can quickly remove the ink with acetone or 70% isoprophyl alcohol. Ferric Chloride is not a dangerous acid, like Nitric acid or Hydrochloric acid. All it does is make metal rust. You can safely neutralize it with baking soda and pour it down the drain, or in the ground. But it does leave dark stains on your hands if you touch it, so use rubber gloves when working with it. And of course, keep children and pets out of the area at all times. I forgot to cover a small container of Ferric Chloride that I re-use for etching in my workshop. I found that (over time) a pegboard stocked full of tools, screw drivers, wire cutters, scissors, and other metals containing iron, mysteriously rusted much faster than normal. (I live in Tucson, AZ where we have a very dry climate and rust is rarely a problem.) So, keep the container of Ferric Chloride covered, or store it away from tools. If left uncovered for more than an hour or two, it may evaporate into the air and attack tools containing iron left in the same room. This is my very own personal unscientific theory. So take this advice FWIW. Ferric Chloride is used by copper circuit board designers. Radio Shack used to carry Ferric Chloride in pints. But they no longer carry it in Tucson, AZ. I buy it, by the gallon, from a chemical supplier here in Tucson. Note: If you order it from an out-of-state supplier, they will add substantial HAZMAT shipping charges, so it is best to find a local chemical supplier. 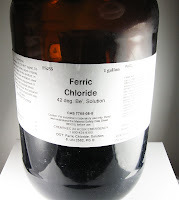 Many electronic specialty stores carry Ferric Chloride. I have purchased it in crystal form, which works fine too, but I can’t remember the ratio of crystals to water. If you buy it in crystal form, ask your supplier what quantity to mix with water to make a solution that will etch brass or copper quickly. The bottle of liquid Ferric Chloride (photo top left) is what I am using now. It works great, full strength, straight out of the bottle. I store the brown glass gallon bottle in a cool, dark place, as sunlight will weaken it. You can cover it with a black plastic garbage bag, but make sure you mark it so no one bumps into it accidentally. I have had this bottle for over a year and it hasn’t lost any strength. Make sure it has a plastic cap. * Warning: Never use metal caps on Ferric Chloride containers. I only use about 3 cups at a time, and keep reusing it until it takes longer and longer to achieve the same etch results. Then I throw it out, and start over with a fresh batch. When I use a fresh batch, it will deep etch quickly, in about 30 minutes, so it is good to set a timer and check the etching progress often. After you have used the same batch about 10 times, it will take about 30 minutes longer to achieve the same depth of etch, depending on how many pieces of metal are in the acid bath. I read an article about adding a teaspoon of powdered Ester C to 3 cups of Ferric Chloride to maintain its strength, and it seems to be working. You can buy powdered Ester C at any drug store. This messy looking picture is my acid bath with 7 different pieces of brass, in different thicknesses, submerged for etching at the same time. Always use a plastic (or glass) container for your Ferric Chloride acid bath. The container size depends on the size and shapes of metal you are etching. I have a red metal rolling cart that I bought at Harbor Freight to hold all my etching supplies. The 11” x 9” black plastic tray (a recycled frozen lasagna dish) underneath the etch bath container, protects the red metal rolling cart from any acid drips or spills. The clear plastic container holding the Ferric Chloride acid bath is 6” square by 3” high. You can buy them at any grocery store. They come with covers that fit tightly. Note: Never use a metal container for your acid bath. Ferric Chloride will attack it and quickly corrode it into pieces. When the Ferric Chloride etches brass or copper, tiny loose particles of the etched metal accumulate and clog up the design. In order to get a clean etch, the liquid bath must be kept moving to bump the loose particles to the bottom of the container. OR, USE YOUR DRYER: Alternatively, you can place the Ferric Chloride container on top of your dryer and run the empty dryer on “air dry” while the etching is taking place. The vibration of the running dryer will keep the loose particles from accumulating on the submerged metal. But make sure you use a protective plastic covering to keep any drips of Ferric Chloride off the top of your dryer! Ferric Chloride drips on your dryer will quickly corrode the finish. If you are etching round objects, like bullet shell casings, you can plug the open end of the bullet shell with 4” inch length of thin wooden doweling. This accomplishes 2 things. 1.) It keeps any Ferric Chloride from etching the inside of the bullet shell casing. 2.) It keeps the bullet shell submerged, but still floating above the bottom of the container, so the etched particles fall off easily. If you don’t want to take the time to make a Styrofoam boat for flat pieces of metal, you can punch a small hole in the upper corner of the metal and tie a piece of fishing line to make a loop. Hang these loops over a wooden stick across the top of the Ferric Chloride bath container. The pieces of metal will hang vertically, so the loose particles of etched metal will fall to the bottom of the etching bath. The only problem is that you can sometimes see the deep etched lines that are made by the loose particles falling in a vertical direction. See photo (right) Round disk with MOM design drawn with black Staedtler pen. The design was hung vertically and you can see the vertical lines etched in the finished pendant. If you use a Styrofoam boat the metal will etch evenly (horizontally) without any vertical lines. Below are photos of hand-drawn etch “resist” on flat metal which was etched horizontally on a Styrofoam boat. Note: Make sure you cover any large areas of metal that you DON’T want to etch, (like the back) with clear plastic packing tape. Ferric Chloride will not etch through clear sticky tape if it covers the back of the metal without any bubbles or loose edges. It is a good idea to cut your metal larger than the finished design so you can overlap the tape around the edges of the design. (below left) You can also use strips of tape or fingernail polish as a resist. Simple geometric designs using tape, or organic designs using floor polish or nail polish can be interesting. However, you CAN make a 2-sided design by etching the front and back, at the same time. Use a thick piece of brass (or copper) so you can get a deep etch on both sides. A thinner piece of metal may etch holes all the way through the metal, if you etch both sides at the same time. This hand-drawn design (above) was etched on a floating Styrofoam boat. The back of the metal was taped to prevent any etching on the back. Finished design (below right). While etching, check on your metal designs in the etch bath about every 30 minutes. I use a bamboo shish-ka-bob skewer to gently touch the edges of the design. If the point of the skewer catches on the edges of the lines, you can feel how deep the etch is, without removing it from the etch bath. If the skewer slides across the design, then it hasn’t etched deep enough and needs to stay in the bath longer. Rinse the Ferric Chloride off the metal using a separate container with baking soda and water to stop the etching process. Then rinse in plain water and dry so any areas can be touched up with a red Staedtler pen. Then return the touched up design to the etch bath and proceed as before. When you are satisfied with the depth of the etch, submerge the metal in a separate plastic container (clean yogurt tub, cottage cheese or other plastic or glass works fine) with solution of water and 3 or 4 tablespoons of baking soda. This solution neutralizes the Ferric Chloride that is still on the metal. You can see the baking soda solution fizzing as it neutralizes the acid. If you don’t neutralize the Ferric Chloride that is left on the metal with baking soda, it will continue to etch in microscopic crevices of your design and ruin it later. Next, rinse your metal designs in water and dry. 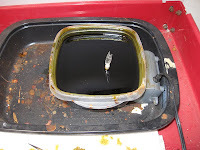 Tightly cover your Ferric Chloride bath so you can use it later. If you want to dispose of an exhausted Ferric Chloride bath, make sure you add enough baking soda to neutralize it. You can tell it is neutralized when it stops fizzing. Then you can safely dispose of the neutralized acid, down the drain, or in the ground. If you wind up with a finished etched design that is missing details and you feel it is ruined, fear not! You can use the GOOD PARTS of the etched metal for smaller patterned designs. Below are interesting pendants made from scrap pieces of etched metal. Please comment or ask questions! Stay tuned for Part IV in this series on Etching. Do what you enjoy! Happy etching! "Talk to a tree, it's older than you and knows more." Thanks for this info! it's great! I'm i Pima County as well - may I ask who sells it local? I buy Ferric Nitrate, Nitric Acid and Ferric Chloride from a local company in Tucson: AdChemco Scientific. Website is: http://www.shop.adchemco.com. No problem with fumes at all. Just make sure you keep Ferric Chloride drips away from anything metal. Always have baking soda nearby to neutralize the acid when you rinse off your metal etchings or want to dispose of it. It is really a "salt" that corrodes slowly, as opposed to Nitric or Muratic acid which produce noxic fumes. GREAT READ! Thank you so much for taking the time to post this info. I'm currently "playing" with bullet casing jewelry (with limited success in my opinion). I wanted to try etching on the brass but had no clue where to start. Your post has been very helpful. Thank you! Pixie in McNeal AZ. I'm so happy you are inspired and motivated to try this! Feel free to ask for help anytime. Virginia Vivier - Amulets at Esprit-Mystique dot com. You are such a nice person to share all these very precious knowledges and experiances here.. Thank you so much.. I just wonder; shall we put ester c just once or after every use. I leave a 1 pint Tupperware plastic container of Ferric Chloride solution (securely covered) outside on my workbench under a covered porch all year. (I never leave it uncovered near any metal tools or other metal implements that may rust from exposure to Ferric Chloride.) It lasts for months, just sitting there unused, as long as it is covered. Whenever I need to etch, I open the container, add about a tablespoon of powdered Ester C that I got at the local drugstore (cheap), and stir it thoroughly. The Ester C seems to keep the Ferric Chloride active and strong. (Occasionally, I filter out the gunk at the bottom of the container, through a plastic strainer, if the solution seems too chunky from previous etchings.) You can tell I use a "very scientific" approach to this etching process! LOL! Some folks have said to dilute the Ferric Chloride to get the best etch. I have never diluted mine. (It is very syrupy, dark greenish-brown in color and seems to work fine. Lasts for months. I get so excited to see the etched results that I pick up the etched metal with my fingers, which stains them if I don't rinse them off immediately! Duh! I mix it (dry crystalline form that I bought from a chemical supplier) with distilled water. The liquid Ferric Chloride you get from Radio Shack or Electronic Stores seems to exhaust quickly, I have no idea why. But it does work a time or two if you have no other sources for crystalline Ferric Chloride. Feel free to contact me with any other questions. You have provided an awesome site. Etched some bullet casings - which had already have a hole in the end. 1) used small bamboo skewer to plug the small hole (snip off and sharpen with pencil sharpener to get several from each skewer). 2) slice heavy foam to 5/8" thick, use casing to cookie-cut plug from foam. This kept the insides dry on 90% of pieces. Thanks for your helpful tute. Excellent blog ! !Thank you very much to share with us,such a wonderful information you provide in your blog articles. Great tutorials! Not sure if you're even looking at these given that these posts are a couple of years old. But 2 questions: 1. where do you typically get your brass. 2. As part of my design I'd like to actually have the etch cut the whole way through in places. I'm assuming I'd have to do a resist on either side of the piece and just leave it in the bath as long as it took to cut through (talking about 1/32"-3/32" thick material here) or is this a bad idea for some reason I haven't really thought of? I sprinkle in a little Ester C each time I etch. Not a lot, but enough to keep it fresh. been improved. I should take the time to add updates! I get my brass from either Rio Grande Jewelry Supply (www.riogrande.com/), Indian Jewelry Supply (http://www.ijsinc.com) or Metalliferous (http://www.metalliferous.com). very long, or use as much acid that way. Just a thought. I use 16 gauge brass. And yes, you have to protect all surfaces that don’t need to be etched. I use packing tape on both sides. Paint will work too. When you insert a dowel in a bullet shell, make sure it is sealed tight 100% so the acid does not get inside the shell. You can sand down the end if it is a little to big to fit. Or, you can plug up the end with a bar of soap. The bullet should float vertically. You don't need the dowel to extend very far out of the shell, maybe 1/2 inch. Insert the shells into the acid bath with the dowels sticking up out of the bath, shell side down. That way you only use a couple of inches of acid bath in a smallish plastic or glass container. Does this help? Virginia, Thank you so much for the quick response. Yes it is a big help;) I wasn't sure if it would float or if I needed to suspend it somehow. Now I know what size dish to use. This is a great article. I tried the acid bath with mixed results. I am using bullet casings and they were submerged, so it was hard to find them in the acid. A colander or strainer might help. Also,they etched at different rates even though they were the same size. The question I have: does the red marker come off with cleaning? Is there something specific I need to do to clean it off the brass? What do you clean the brass with yo remove the red marker after etching? You can clean off the red ink with acetone, fingernail polish cleaner, or alcohol. I would not put a strainer or collander in the acid bath unless it was made of plastic. The Ferric Chloride will definitely attack a metal strainer. Also, the brass shells should etch evenly if they are floating, not sitting on the bottom of the acid bath. The acid bath dish needs to be agitated by sitting the dish on top of a dryer running on "air fluff" (to conserve energy). The vibration of the dryer will help distribute the acid bath a bit and keep it evenly distributed. I prefer to tape a cheap($5) aquarium pump to the outside of the acid bath dish. It will vibrate the acid enough to knock the loose metal particles off the metal and onto the bottom of the dish.